Data losses can cost a business or an individual heftily. According to a report, thousands of businesses and individuals have loss revenues due to data loss. While the hard drives are becoming more reliable source of storage these days, they still leave a lot to be desired. Most of the IT professionals boast about the importance of backing up data, but only a few know how to deal with data losses effectively. If the data is lost from Hard Drive, it becomes next to impossible to recover the data easily. Disk Drill has emerged as powerful hard drive recovery software to recover the lost data from hard disk. Pandora Data Recovery is the older name of this hard drive data recovery tool. A user can recover up to 500MB data for free from a hard disk. To recover more data, he/she has to upgrade to the premium plan. Let us find more info about this software in the following post. Disk Drill is one of the best free data recovery software tools that are capable of recovering data from hard drive easily. It is a unique product because it can undelete the files from emptied Recycle Bin by eyeing at the underlying file system. You can download the free version of this HDD recovery software from here and recover up to 500MB data for free. How this Hard Drive Data Recovery Software Works? Whenever a file or folder gets deleted on a major file system, it is only the filename that gets affected by this action. In most primitive cases, it only loses its first character, and the disk space where the file actually resided is marked available for any new data ensuring the fastest deletion possible. This also results in disk sectors which are still storing the deleted data. 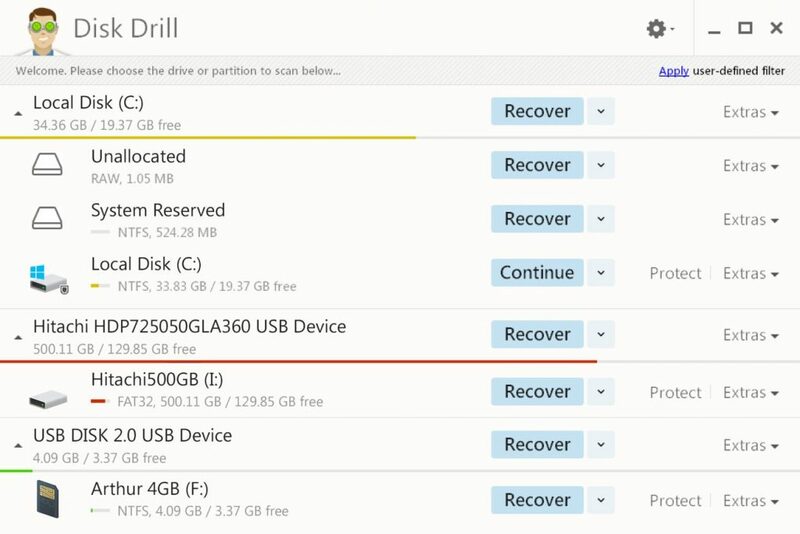 This makes Disk Drill still recover the lost data. It offers the best breed of data recovery algorithms to scavenge the lost data for you. 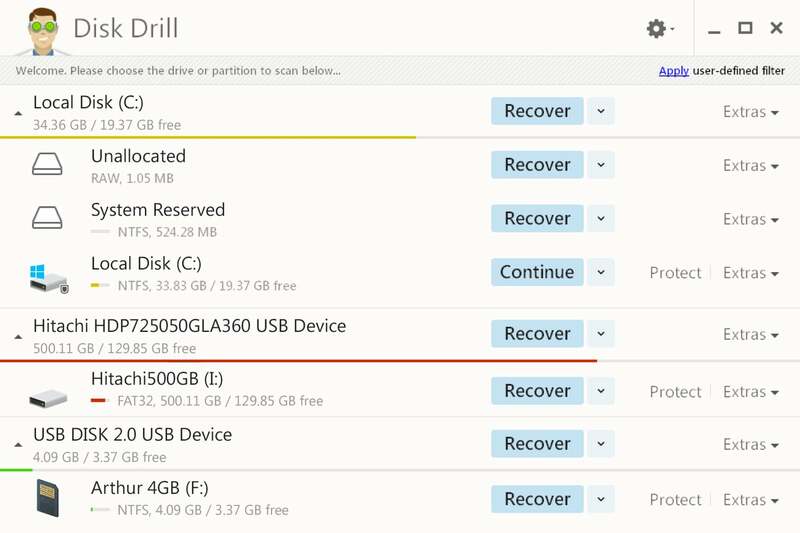 Reliable File Recovery: Disk Drill scans the hard drive and storage devices to locate the deleted files and directories. The existing data gets extracted during the scanning phase and the lost data is marked for the recovery. The fragmented files are then collected from the original chunks to bring them back to life. Once the process of scanning is complete, you have full control over which file to recover and where to store the recovered data. Comprehensive Filters: Disk Drill makes it easy for you to find the files you were looking for by providing you advanced filtering options. You can find the files by their full/partial name, file size, type and extension, creation and modification dates etc. A regular file recovery scan can bring back thousands of lost files that users might not have seen before. So, Disk Drill makes it easy for the users to find the file they were looking for. Beautiful UI: It offers a high-quality user interface to its users making it easy for them to navigate through and search for different options. Disk Drill is one of the best free hard disk data recovery software tools available across the internet. Though its free version allows you to recover up to 500MB data, you can always upgrade to the pro plan to recover data with more size.